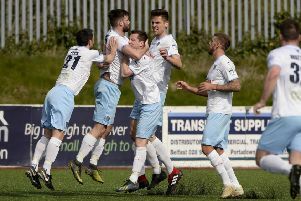 Glenn Ferguson is keen to re-sign defender Caolan Loughran for a second spell at Ballymena United. Picture: Press Eye. Ballymena United boss Glenn Ferguson is hopeful of re-signing defender Caolan Loughran in the January transfer window. The homegrown centre-back had previously been on United’s books before going to America where he had been awarded a soccer scholarship. Having cut short his time in the States for personal reasons, Loughran returned to Ballymena outside of the transfer window, meaning he couldn’t rejoin the Sky Blues and he has been playing in the Ballymena Saturday Morning League for All Saints Old Boys. “Caolan is coming back in January to have another go and I’m pleased about that,” Ferguson told Times Sport. “With the potential he showed previously, there’s every chance he would ne playing regularly in the Irish League if he hadn’t gone to America but you have to take opportunities like that when they come along. “Now he’s back, he has a great chance again, especially with Gareth Rodger’s loan spell finishing. As well as shoring up United’s porous defence, Ferguson will also be looking to strengthen other areas of his team if possible. “January is always a notoriously hard time to get players in because usually you’re restricted to players who aren’t needed at other clubs but we’ll keep looking. “We would need to let people go before we can bring others in but if someone doesn’t want to be here, there’s no point in keeping them. “We will also be looking to get some of our important players tied down on new contracts in the coming weeks,” added Ferguson.